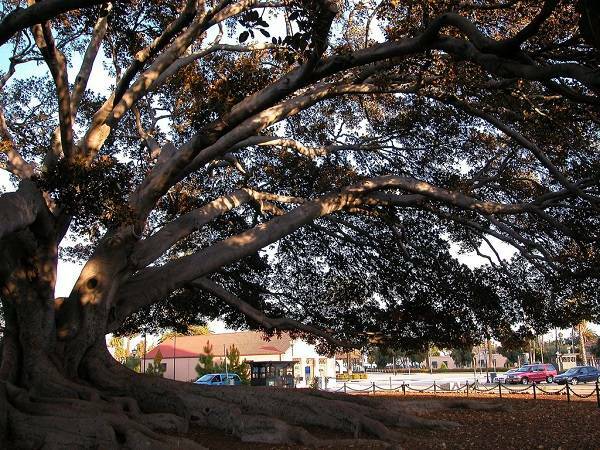 Did you know one of the largest Moreton Bay Fig Trees is right here on State St.! On TripAdvisor it’s considered to within the top 20 of "Must Sees" while your visiting Santa Barbara. This tree is tucked behind the train station and right by the 101 freeway. It is said that in 1874 an Australian sailor visited Santa Barbara and gave a small seed to a little girl. This girl planted in on State St. and now that seed has grown to one of the largest trees we have today! The branches span a total of 170 feet wide and providing shade for all those who sit under it. So if you’re looking for a shady spot to have a picnic, read a book or want to climb a tree, this is the place to go! Join us tomorrow at the Cafe as we talk about the "cooler" things in life and places we like to go to get out of this spring heat. Snacks and coffee will be provided. Invite your friends and come meet some new people from all over the world! We meet at 821 State St. Unit B (Right by RiteAid and above Sur La Table) from 4:30 – 6:30 pm.